Delos is a small island in Greece, but was once the financial and artistic center of the Mediterranean. Above are statues of a rich woman, Cleopatra, once commissioned. 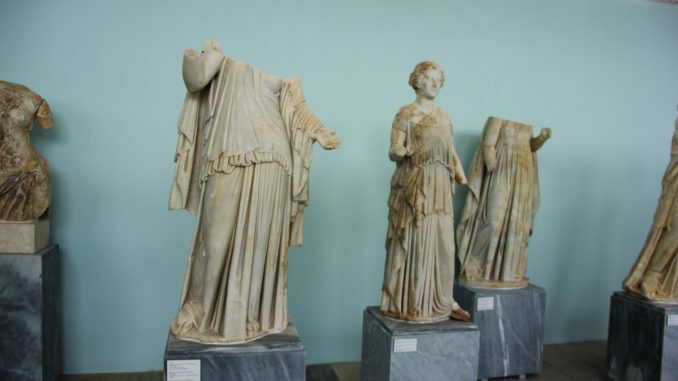 Over the centuries, many of the statues were vandalized or stolen. The heads, specifically, were often taken as easy spoils. 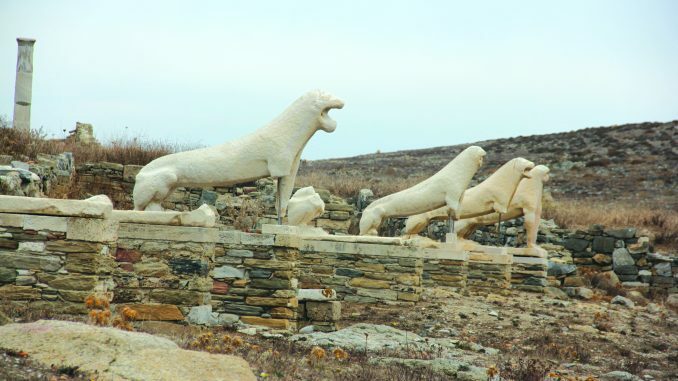 Pieces of Archeology from Delos are on display in museums all over the world. Only a fraction of the site of the once prosperous city have been uncovered in archeological work. Above is a view of the Aegean Ocean and the city across the bay where people from Delos were sent when birth or death were imminent. 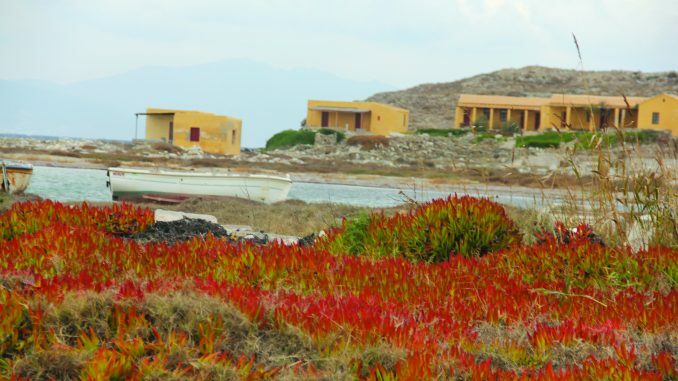 Delos is both an island and, according to some Internet accounts, unsurpassed on the planet as a natural insular archeological site in size and importance as well as the world’s premier source of monumental antiquities. 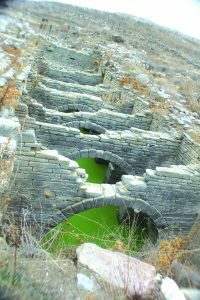 We had a guide and also I researched online for the story of Delos. It is a UNESCO (United Nations Educational, Scientific and Cultural Organization) world heritage site. 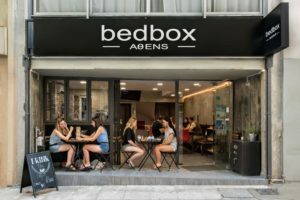 Now uninhabited, except by cats, the site was once home to a sophisticated and unparalleled society. It was a city known to be sacred as the birthplace of Apollo and Artemis, and the world’s leading destination of religious pilgrims. Habitation began as early as 3000 years before Christ, but it reached its axis of supremacy from 1580 to 1200 BC. The island is located in the center of the Aegean Sea’s Cyclades archipelago, a series of islands at one time a major trade route. It was (and is) central to travel to and from Athens, Aegean, Corinth, Macedonia, Hassocks, Samoa, Rhodes and Crete. It was the best-known location in the known world of ancient Greece, and home to the wealthiest and most successful Greeks. Although it was (and is) mostly windswept and barren of vegetation, the city, in its day, featured lavish homes, sophisticated water and sewer systems, which remains as ruins today, a central amphitheater from which government business was conducted, a marketplace and thousands of sculptures, murals and other works of art. There were an estimated 25,000 inhabitants on this small island. It even had a stock market where entrepreneurs could bet on futures. Because it was considered sacred, births and deaths were not allowed. Those about to give birth or the very ill were removed to a nearby island of Rineia. The island was inhabited for so many thousands of years that the rub of ropes for buckets of water were grooved deep into stone. 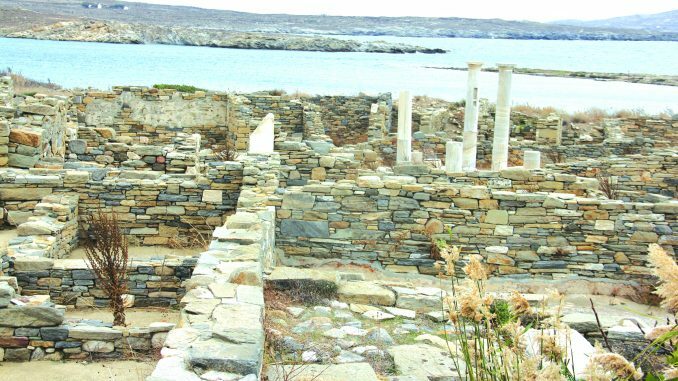 The wealth and prosperity of Delos was known to the known world at the time and it was a magnet to craftsmen and artisans, whose work was prized by the very rich. They commissioned household art, statues of themselves and the gods, and used art to show their prosperity. The inhabitants had every reason to assume their safety due to the sacred nature of the city, so they had no army. The society came to an abrupt end after thousands of years when they were invaded by the Roman army, our guide told us. In one day the Romans killed half the population and took the other half as slaves for sale or to fight to death in the Roman Coliseum. They plundered all the treasure they could take, along with their prisoners. A few ran away and came back, as evidenced by some skeletons found in the ruins, but the survivors did not last. Over the years the site was plundered further for art, building supplies and any other valuables. It was destroyed to ruins. In 1873 the French School of Archeology began excavating and trying to piece together the ruins. Our guide told us work has been slow and intermittent because there is no funding for such work. Today is it difficult to see more than the remnants of home sites and selling stalls, old wells still filled with water, pieces of pottery, furniture and statues remain in pieces. Every year an excavator will find one or two packets of treasures inhabitants stashed away in the suddenness of the attack, no doubt hoping to someday return and retrieve their valuables. One of the most venerable examples of artwork was a line of lions that led to the Temple of Apollo. It was estimated there were nine to nineteen of them originally. They represented the then very real Eurasian lions that plagued the ancient times. Cities were walled back then, in part, to keep the lions out. Man-eaters, they waited outside the city walls all over Europe, and it was not easy before guns and other weapons to protect oneself or family from the beasts. The five remaining lions are now indoor at the small museum on the island, and replicas stand on the original location. One, in 1716, was taken to Venice. Venetian artists repaired the missing head with a preposterous replacement, and that lion can be seen in Venice to this day as the city’s icon. Although these photos don’t reflect it, there were lots of cats on Delos. We asked about it and our guide said attempts were made to reduce the population but they persist. We asked what they ate and were told hedgehogs. Later see more about Greece’s cat problem.